A drill rig working on a relief well is returning to the site of the Gulf of Mexico oil spill after an oncoming storm system weakened, a BP spokesman told AFP Saturday. I'd love to know what Admiral Allen found so humorous - VP Biden? Me too! ON THE GULF OF MEXICO — Work to permanently choke off BP’s broken oil well stalled Friday as Tropical Storm Bonnie raced toward the Gulf of Mexico and dozens of ships evacuated the area. Engineers are so confident in the stability of an experimental plug – which has mostly throttled the oil for more than a week – that they won’t open it even if the storm hits directly. They’ll likely lose sight of the temporary cap for at least a few days. The storm blossomed over the Bahamas and was to enter the Gulf of Mexico by the weekend, and a tropical storm watch was issued early Friday for the northern Gulf coast from Destin, Fla., to Morgan City, La. The rough weather could delay by another 12 days the push to plug the broken well for good using mud and cement, retired Coast Guard Adm. Thad Allen and BP officials conceded. Even if it’s not a direct hit, the rough weather will push back efforts to kill the well by at least a week. A week of steady measurements through cameras and other devices convinced Allen they don’t need to open vents to relieve pressure on the cap, which engineers had worried might contribute to leaks underground and an even bigger blowout. The cap was attached a week ago, and only minor leaks have been detected. With Tropical Storm Bonnie heading into the Gulf of Mexico and expected to kick up high waves and winds near the Deepwater Horizon oil spill site this weekend, crews on Thursday began disconnecting the rigs drilling two relief wells in the Gulf, effectively delaying the effort to permanently plug the blown-out Macondo well by nearly two weeks. Late Thursday, the federal government ordered dozens of ships to evacuate the spill site. The National Hurricane Center named Tropical Storm Bonnie on Thursday about 5:15 p.m. after an Air Force reconnaissance plane recorded surface winds of 40 mph near the Bahamas. It is the second named storm of the Atlantic hurricane season. Tropical storm force winds and seas of up to 8 feet are forecast over Gulf waters, including the site of the Deepwater Horizon blowout, by Saturday, according to the Slidell office of the National Weather Service. Tides along Louisiana’s coast could increase by 2 to 3 feet above predicted levels because of strong easterly and southeasterly winds, and rainfall could total 2 to 4 inches, with some isolated higher amounts possible through Monday. The chance of rain in New Orleans will rise to 40 percent on Saturday and 60 percent by Sunday. Although it had yet to reach the Gulf of Mexico on Thursday night, the storm had already affected all facets of the oil spill response effort. BP temporarily suspended work on its primary relief well Wednesday morning by plugging it with a stopper. 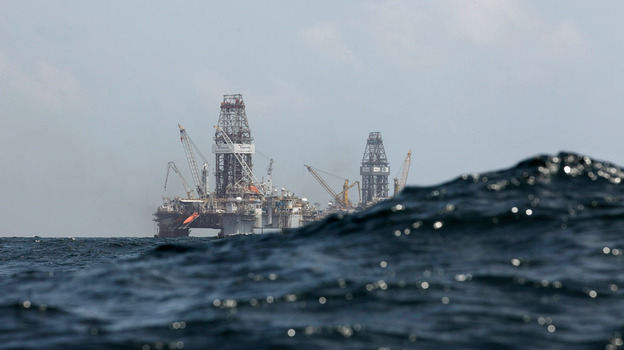 On Thursday night, the company said it will disconnect the rigs from the well and move them out of the way of the storm, though they will remain in the Gulf. That pushes back the planned interception of the Macondo well by nearly two weeks to mid-August. It could take anywhere from days to a few weeks to fill the well with mud and seal it after it is intercepted. The two vessels drilling the relief well are the first to be removed because they take the longest to disconnect and move the most slowly. Other vessels, including the Q4000 and the Helix Producer, require shorter amounts of time to disconnect. After the rigs are reconnected to the relief wells and the primary well is lined with casing — one of the final steps before the wells intercept — BP will likely attempt a “static kill” of the Macondo well, Wells said. The procedure, which involves pumping heavy mud into the well at low pressure and rates of speed until it pushes oil back into the reservoir, has received preliminary approval from Allen, Wells said. Were it not for weather, the maneuver could have been tried this weekend. BP will seek Allen’s approval again before executing the kill, Wells said. In a bit of bright news, BP and government officials also said Thursday that they will leave the well capped, even if a storm forces all of the vessels monitoring the cap out of the way. The well has been capped for just more than a week as BP crews and scientists study the pressure inside to determine whether the well has integrity, meaning it is intact, or whether there are holes somewhere beneath the seafloor where oil is escaping. Pressure inside the well was at 6,863 pounds per square inch and still slowly climbing Thursday afternoon. Before it was capped last week, the well had been gushing oil into the Gulf of Mexico for nearly three months, since the Deepwater Horizon rig exploded and sank 50 miles off the Louisiana April 20. Eleven people died in the accident. If an evacuation were necessary, the last vessels to leave would be the ones operating the vehicles that are monitoring the well and conducting surveillance in search of oil leaks subsurface. Wells said scientists are also looking at ways of recording data from the site if the remote operated vehicles are evacuated. The storm is also impacting oil response efforts on the surface and shore. Surplus response equipment, including boom, that had been staged in low-lying areas is being trucked to staging facilities on higher ground, said Coast Guard Rear Adm. Paul Zukunft, who is leading the surface response. The equipment can be returned in six to eight hours, Zukunft said. Boom was also being removed Thursday from marsh areas where oil is not threatening the shore to prevent damage from heavy equipment. Meanwhile, more than 1,000 vessels that had been operating in the Gulf in various capacities, including as skimmers or as vessels of opportunity working to place boom, have been decontaminated and brought to shore in advance of the approaching storm. “They’re being put in a position where they would be ready to respond if weather improves,” Zukunft said. So far, there are no signs that suggest workers will need to be evacuated, Zukunft said. But if that changes, they will be evacuated before an official order for evacuation is made by various parish presidents so as not to impede the evacuation process of coastal residents. Bonnie was predicted to make landfall near Morgan City on Sunday about 2 p.m., with the potential error bubble stretching from an area west of Galveston, Texas, to Mobile, Ala., according to a forecast released by the National Hurricane Center late Thursday afternoon. BP has temporarily corked a relief tunnel deep beneath the sea floor as tropical rainstorms move toward the Gulf of Mexico. well, hopefully sealing it off for good. But the threat of a tropical storm has prompted the oil giant to shut off the tunnel to keep it from being damaged. BP vice president Kent Wells says the relief well was plugged Wednesday morning and drilling was halted. becoming a tropical depression or storm within the next 48 hours. The post was made because many of the papers continue, to this day, to repeat “speculation” and “fictions” as fact …. example, “the gulf well is 36,000 feet deep”, when, in fact, the well is 18,000 feet deep. Exactly how difficult can it be to get this type of fact correct? Just yesterday major American news organizations posted headlines proclaiming that “Congressional Hearings” were cancelled because “witneses” who were “BP employees” had not appear before the committee. In another instance CNN.com posted a headline that, and I’ll need to paraphrase, “BP Exec testifies to leak in a safety device”, above a video of the the “testimony”. Not one of the 4 employees who “failed to appear” worked for BP, they were all Transocean Employees. Transocean is the owner/operated of the drilling rig. The “BP Exec” on CNN’s “video” was, as announcer on the video clearly states, “an emplopyee of Transocean”. The gentleman was neither an “exec” nor was he an employee of BP. Later in the day testimony confirmed that the “witness” was not very well informed, the “safety device”, a BOP, had passed vigorus testing days after the alleged event that this “rig worker” reported on. Did you know that of the 126 workers on the Deepwater Horizon Rig, only 7 were in the employ of BP. What political reason could there be for the Guardian to do this? I beleive the post treats BP very fairly …. pointing out the fact that the Obama Administration has controilled all aspects of the “well repair” for months. The Guardian’s readers who accessed the post appeared to have “liked” the article … not a single negative or derogatory comment was received on this blog. “Finished extensive research into what happened to the Deepwater Horizon and what has transpired since it sank on 04/22/2010. My posts are fully linked and sited. What reason for this censorship? 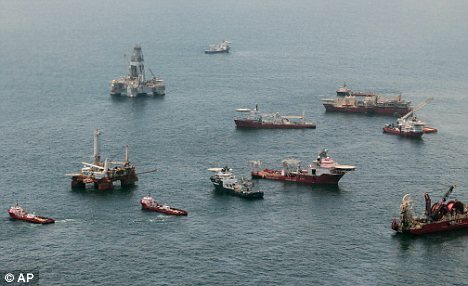 Concerned that stormy weather might soon force an evacuation in the Gulf of Mexico, BP temporarily suspended work on a relief well considered to be the ultimate solution for plugging the blown-out Macondo well that until last week had been gushing oil into the Gulf of Mexico, BP Vice President Kent Wells said. “We’re having to watch the weather very, very carefully now and adjust our plans accordingly,” Wells said. Weather concerns are focused around a cluster of thunderstorms just east of the Bahamas that as of Wednesday evening had a 40 percent chance of developing into a tropical depression. Should that system develop, it could cause high winds and waves over the Deepwater Horizon spill site. Tropical rainstorms moving toward the Gulf of Mexico (click for New Orleans Storm Update) Wednesday threatened to shut down undersea efforts to seal BP’s ruptured well, interrupting work just as engineers get close to plugging the leak with mud and cement. Retired U.S. Coast Guard Adm. Thad Allen said a weather system brewing in the Caribbean could force crews to abandon their watch over the experimental cap that’s been bottling oil a mile below the surface of the water for nearly a week. Scientists have been scrutinizing underwater cameras and data for days, trying to determine if the cap is displacing pressure and causing leaks underground. If storms keep them from seeing the cap and getting those readings — for up to four days, Allen said — BP could reopen the well to avoid missing signs it is buckling. “This is necessarily going to be a judgment call,” said Allen, the federal government’s point man on the Gulf of Mexico oil spill who will make the ultimate decision. Forecasters say the storm system likely will move into the Gulf of Mexico over the weekend, although it appears to be weakening. Right now, it has a 50 percent chance of becoming a tropical depression or storm within the next 48 hours. Even if the storm doesn’t hit the area directly, it could affect containment and cleanup. Hurricane Alex didn’t get closer than 500 miles from the spill in late June, yet offshore skimming in Alabama, Mississippi and Florida was essentially curtailed for nearly a week. In Florida, crews were removing protective boom intended to buffer the state’s inland waterways in the Panhandle from oil. High winds and storm surge could carry the boom into sensitive wetlands, damaging those areas. It could take several days to evacuate ships from the well site 50 miles off the Louisiana coast, where the BP-leased Deepwater Horizon rig exploded April 20, killing 11 and touching off one of America’s worst environmental crises. Shell Oil, the U.S. arm of Royal Dutch Shell PLC, already has begun evacuating personnel not essential to producing and drilling on their operations in the Gulf. BP crews are in the final stages of readying a relief tunnel before boring into the side of the ruptured well to dump heavy mud and cement, sealing it for good. BP also may pump mud and cement from the top, to make efforts at the bottom easier. That procedure, called a surface kill, would occur before the well is ultimately plugged from below. Before talk of nasty weather, BP was inching closer to completion and had hoped for a permanent plug by early August. The temporary cork in the well has helped cleanup efforts, and Allen said skimming vessels are starting to have trouble finding oil to collect. BP has about 1,600 boats operating daily in waters off Alabama, Florida and Mississippi, 600 fewer than last week, said Matt Kissinger, director of BP’s “vessels of opportunity” program in the region. Some boat captains, many earning more through the cleanup than they typically do from fishing, are worried it’s a sign BP is leaving the Gulf too early. Shrimper Minh V. Le of Bayou La Batre had both of his boats out skimming for oil initially, but one has been deactivated.